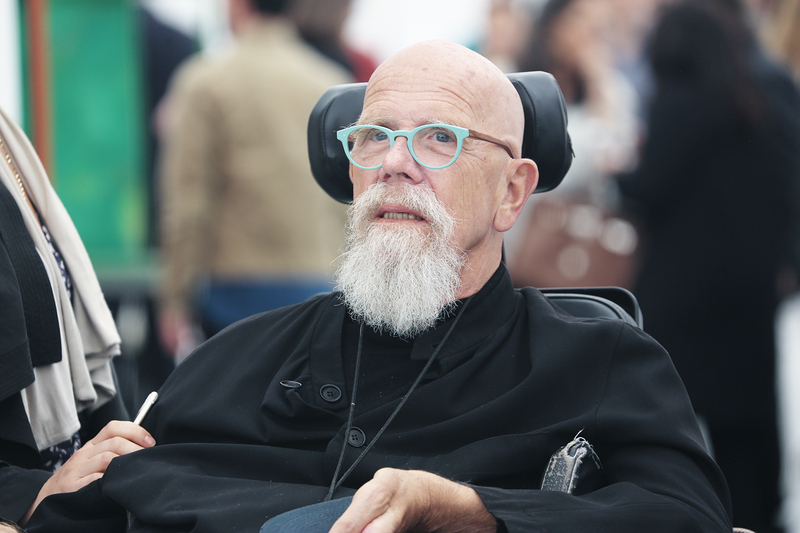 Artist Chuck Close at Freize Art Fair NYC. Photo by EMS. Obtaining self-mastery or enlightenment during Frieze week is not an easy mission. 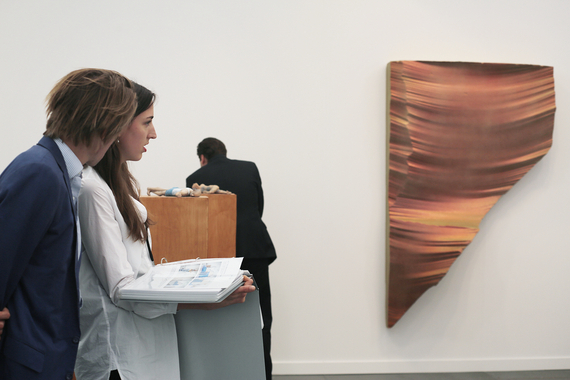 Frieze Art Fair New York poses many challenges for art dealers, artists, collectors and its boosters, known as patrons. Most of this is psychological. Think of a confidence course set up of many obstacles one must overcome in a military-style boot camp. At the end of the day you are either enlightened or defeated. 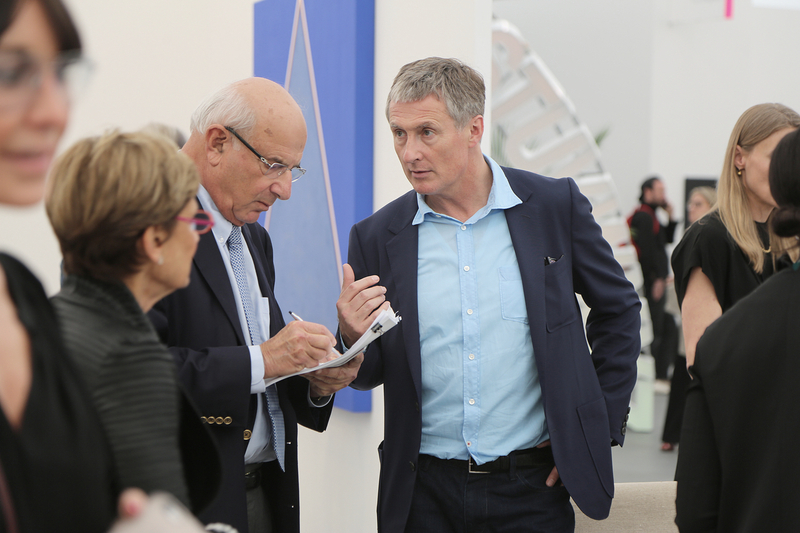 I say this because many people in the art world do not understand, or seem to be confused by, the caliber of art these mega fairs exhibit, which is prime real estate for the most coveted works by highly-sophisticated collectors and patronage. I speak of this as someone who has read the social media comments of mainstream art world fanatics making undisciplined remarks on an elite class of art that they cannot yet comprehend or may never understand. David Zwirner. Photo by EMS. I think of Frieze as a Ferrari showroom displaying the latest models to the most-vintage collectibles. High-net Ferrari enthusiasts covet the latest Spider to the California T to a vintage Classic or GTO. How about a Rolex Submariner, Yacht-master or Daytona? She may like a Cellini or an Oyster? Or they might just like it all. What about museum collections on the hunt for their prestigious coffers? My point is that Ferraris and Rolexes are not intended for most, but for a select target group that will honor the brands' history and exquisite attention to detail and material. Frieze is a showroom of Ferraris, Tiffany's, and Gulfstreams. There are definitely art fairs for the Buick and Ford enthusiasts, and even wheel barrels, tractors, and roller skates. All of these objects have their own merit and deserve to be honored as well, but during Frieze week you will witness the elite, nothing more, and nothing less. Jerry Saltz (center) and Jeff Poe (Blum and Poe). Photo by EMS. Overlooking the East River, Frieze New York completed its fourth annual assignment on Randall's Island Park, Manhattan from May 14th-17th, 2015. 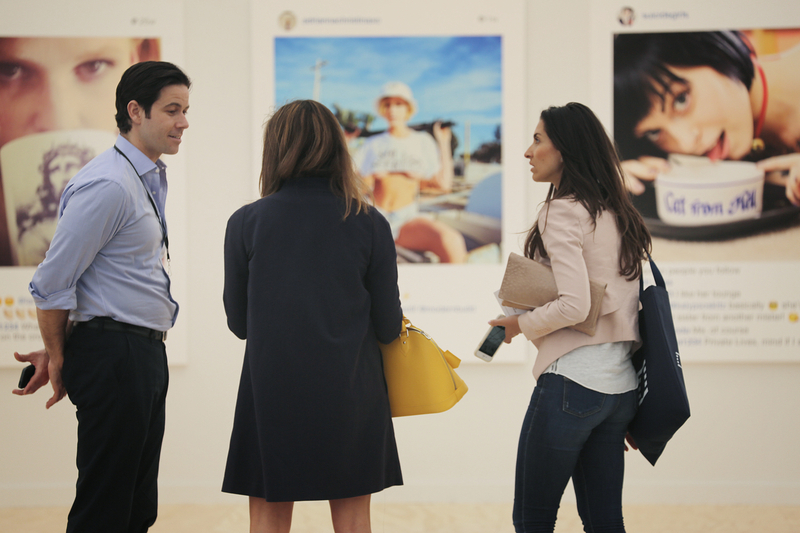 Sponsored by Deutsche Bank, Frieze could only be accessed by ferry or expensive taxi and Uber rides. Randall's Island for many Manhattanite art locals was considered "no man's land". I asked one veteran of the art scene, "Why Randall's Island?" His simple response, "Because they can." 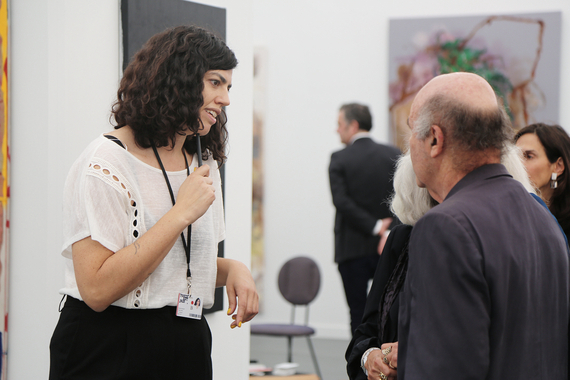 This remark was in light of the so-called satellite fairs, Art Miami, NADA, and SELECT that were located in much more digestible locations to access during the anointed self-proclaimed "Frieze Week." Paul Schimmel at the Hauser and Wirth booth. Though based in Los Angeles, I had the opportunity to photograph Frieze as part of my Take 1 Art Series survey assessment at the VIP opening on Wednesday, May 13th, where the elite of the elite flock to and big-time business is made. The VIP or vernissage hours can be both the most exciting and stressful hours of the fair for everyone involved. Under the bright lights it seemed more Marilyn Manson "The Beautiful People" than Jay Z's "Picasso Baby," especially after a dispute between Shawn Carter and Marina Abramović made headlines during the week when quid pro quo promises alledgedly weren't made. Abramović felt snubbed and made her dissatisfied comments public for participating in Jay Z's 2013 music video for the song, titled "Picasso Baby: A Performance Art Film" that was shot at the Pace Gallery in New York City. Luckily for us all, tempers cooled when the donation was proven to be made - Just a misunderstanding - Just eggs on your face mixed with cocaine and caviar. No harm, no foul, after all - this is the unregulated cynical side of the art world. David Kordansky. Photo by EMS. Susanne Vielmetter. Photo by EMS. Doing reconnaissance during elite art fairs like Frieze and Basel, reminds me of Fellini's 8 ½. One has a euphoric feeling of wonderment like Marcello Mastroianni in the film, navigating beautiful people, beautiful dealers, beautiful art, all being fast tracked into history. I've recently compared LA's art scene to a Michael Bay film, while Luc Besson could direct Frieze. La femme Nikita deliberately purchasing art down the rows of international galleries, single minded, super aware, front-sight-focus - on double espresso. Feeling like Mastroianni and Nikita, all I could think about was the target rich environment called Frieze that had so many high value targets posing as low hanging fruit for me to photograph. Sheikh Mohammed Rashid Al-Thani and Nancy Gamboa. Photo by EMS. At Frieze, I ran into the young, astute collector Sheikh Mohammed Rashid Al-Thani. 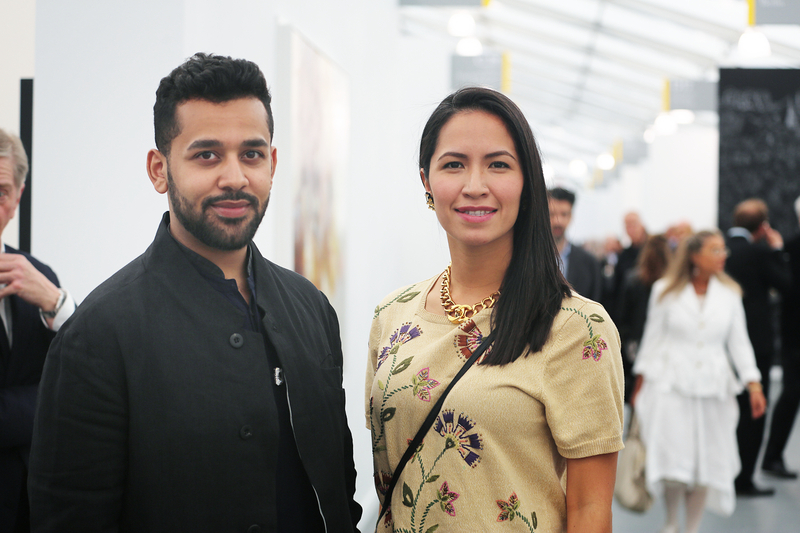 Mohammed is generally arm in arm with his BFF, art advisor Veronica Fernandez, but opening day, I found him doing the rounds with Fernandez' partner, Nancy Gamboa. 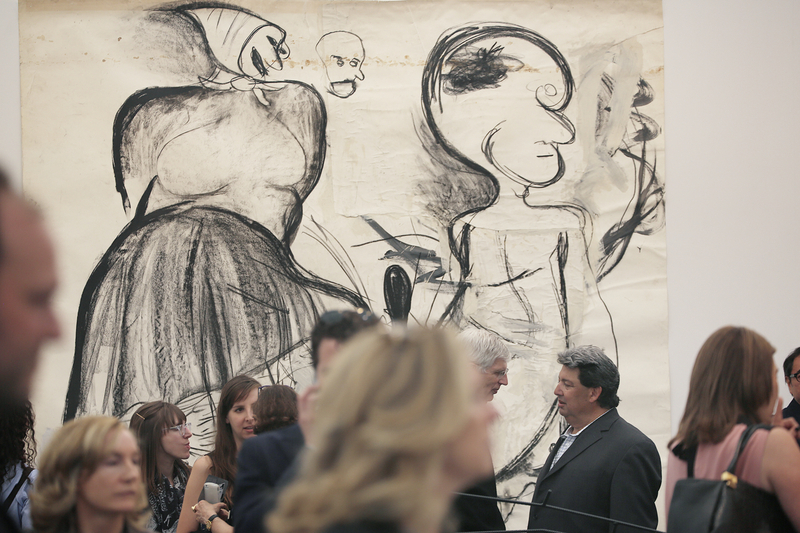 Mohammed happens to be the cousin of former Qatari Prime Minister Hamad bin Jassim bin Jaber Al-Thani, the man who bought the Picasso painting Femmes d'Alger (Version "O") for a record $179.4 million at Christie's on May 11th, the Monday of Frieze week. Francois Ghebaly. Photo by EMS. Davida Nemeroff of Night Gallery. Photo by EMS. Mohammed was keen on LA galleries, Blum & Poe, Francois Ghebaly, and Night Gallery and was impressed by the work of LA artists Alex Olson, Julian Hoeber, Calvin Marcus, and Matt Connors. "We were struck by a terrific black and white sculptural wall piece by Julian Hoeber at Blum & Poe. The first in a new series, the work is graphic and appears to be flat from afar, but upon closer inspection, it reveals a surprisingly seductive dimensionality and handcrafted quality,' Nancy Gamboa said. At CLEARING, gallery director and close friend of Mohammed, Harry Scrymgeour, led both through a collection of humorous and provocative figurative drawings by recent UCLA grad Calvin Marcus. Gamboa concluded, "Overall it was a great showing for Los Angeles. 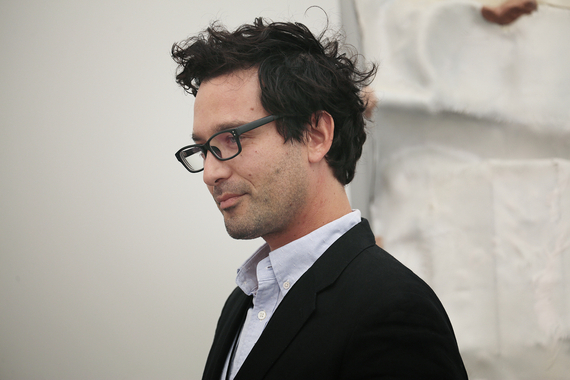 LA artists and the galleries that represent them can be proud." 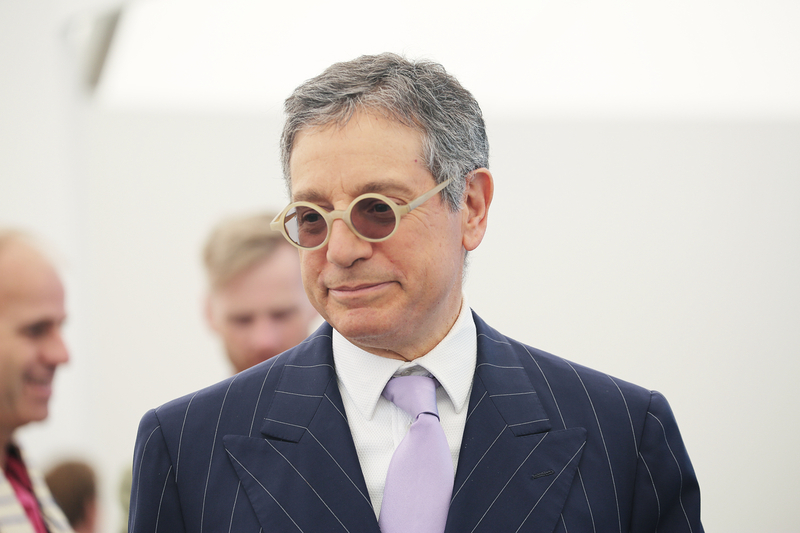 Jeffrey Deitch. Photo by EMS. Piero Golia art at Bartolami Gallery. Photo by EMS. Prior to Frieze opening, Sotheby's kicked off the week hosting a dinner on Sunday for MOCA board members and other major collectors. Notable attendees included Adam Sender, Maurice Marciano, Bruce Karatz and Lilly Tartikoff Karatz, Elon Musk and Veronica Fernandez, Nicolas Berggruen, and Cathy Vedovi. 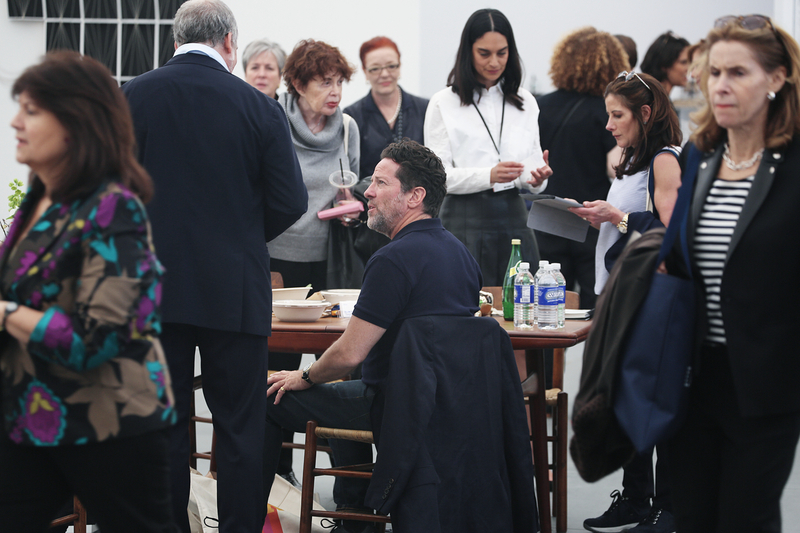 The May 12th evening auction featured major works donated by LA art-stars such as Mark Bradford, Mark Grotjahn, Barbara Kruger and Ed Ruscha. The auction raised a stratospheric $22.5M. 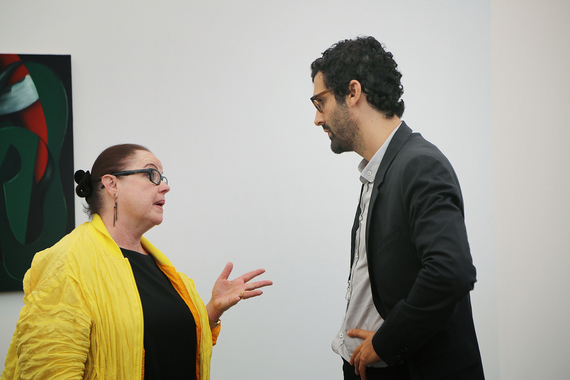 Angela Brazda of Lisson Gallery. Photo by EMS. Tif Sigfrids and Alex Couri. Photo by EMS. So who sold what and what were some of the numbers? James Cohan Gallery sold a major work by Dutch sculptor Folkert de Jong to Pierre Trahan. 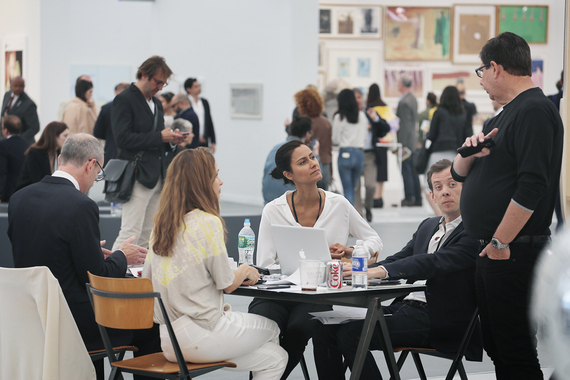 LA dealer Jonathan Novak acquired several works by David Shrigley from Anton Kern at Frieze. 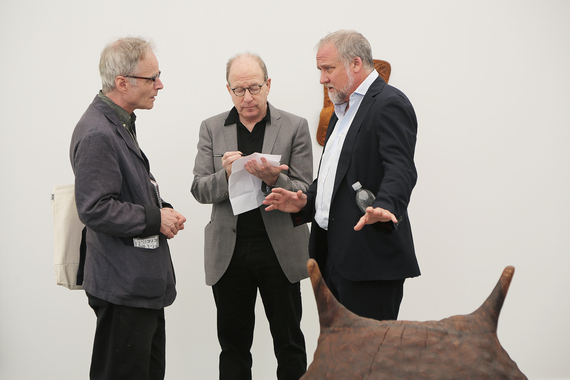 David Zwirner Gallery featured John McCrackens with prices ranging from $250,000 - $1.8 million. A tall red sculpture by McCracken sold for $850,000. 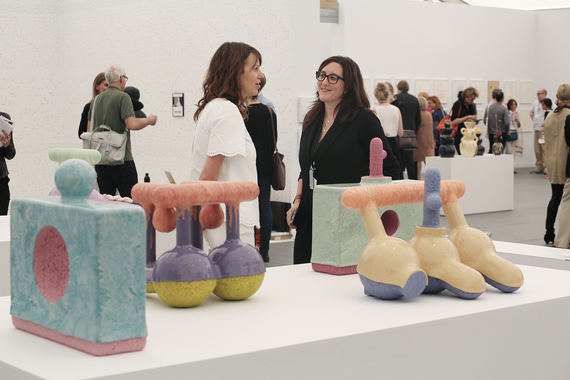 Zwirner is now the exclusive distributor of the Franz West furniture. At the fair the furniture's prices ranged from $30,000 (club chair) to $100,000 (couch), which were at the booth. Zwirner sold two pairs of club chairs (four chairs total, to two collectors), and a set of two club chairs plus a couch to a third collector. Tim Blum and Sarvia Jasso. Photo by EMS. Blum & Poe sold Carroll Dunham's (Solar Eruption, 2000-2001) painting for $550,000. Pace Gallery sold seven drawings by Tuttle from his "Aspects' series, which he completed in Maine in the summer of 2014 for $35,000 each. Lehmann Maupin sold an oval photograph measuring 50 x 38.4 inches by Catherine Opie, entitled, Mary, 2012, which was acquired by a prominent Turkish foundation. Hauser & Wirth sold a Paul McCarthy for an even million. Just a few hours into the VIP, all Richard Prince pieces were sold except for one at Gagosian Gallery. They were priced at $90,000 each. Acquavella Galleries sold a painting by Jean Dubuffet for $1 million, a painting by Wayne Thiebaud for nearly $2 million, three works by Jacob El Hanani for $40,000 each, and a gunpowder drawing by Ed Ruscha for over $300,000. Carla Camacho of Lehmann Maupin. Photo by EMS. Ken Maxwell of Gagosian Gallery. Photo by EMS. The Whitney Museum also opened its doors at its new location in the West Village/Meatpacking District on May 1st. 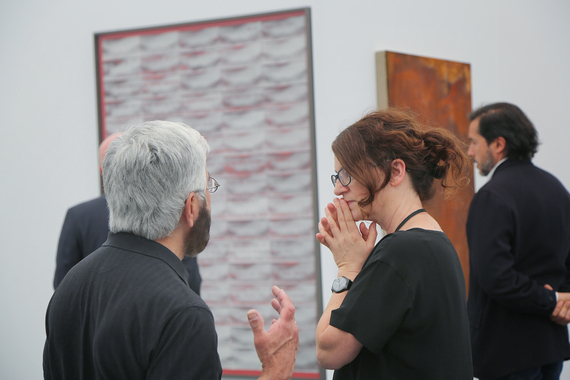 The Whitney was well attended during Frieze week, on the to-do-list for most people attending the fairs, especially since it featured its inaugural show "America Is Hard to See." The exhibition "takes the inauguration of the Museum's new building as an opportunity to reexamine the history of art in the United States from the beginning of the twentieth century to the present." Many Angelenos were proud to see California artists well represented: Larry Bell, Ed Ruscha, Lari Pittman, John McCracken, Wayne Thiebaud and Chris Burden (who sadly passed away at the beginning of Frieze week on May 10 at age 69). 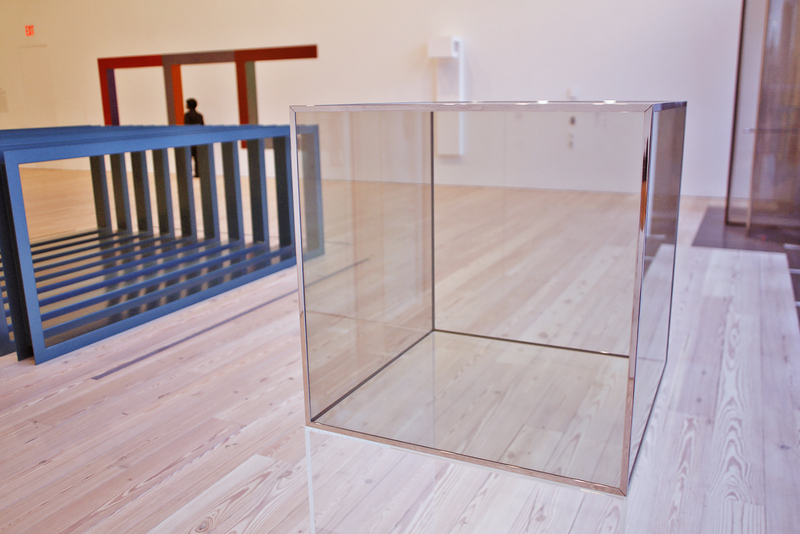 Larry Bell at the Whitney. Photo by EMS. Finally, people were talking about LA-native Fawn Rogers' new exhibition entitled "Court," which was on view during Frieze at both NADA and Select Art Fairs. Rogers' installation at SELECT art fair featured and courted collectors and artists alike, and was mentioned to me many times during the week there as something I should check out. Housed within a boho-chic tent installation, the exhibition was comprised of archival, limited edition double-sided works drawn from the artist's 55 original paintings featuring images of influential art collectors presented as a deck of playing cards, accompanied by standard-sized decks, opulent seating, and traditional gaming paraphernalia. "Court" attracted a number of high-profile collectors, including Bodo Korsig and Steve Shane, who playfully turned Rogers over his knee to scold her for not including him in the deck. Prior to installation, Peter Eleey from MoMA PS1 was the first to snap photos of several of the cards to share with collectors, and many visitors later followed suit. Following the fair, MoMA board member A.C. Hudgins perused the deck, retrieved a card featuring Agnes Gund, and said, "This is a very special, extraordinary person; you should meet her." One of the original "Court" paintings also made an appearance in a high-stakes, winner-take-all poker game in which artists Melissa Brown, Fawn Rogers, Ellen Altfest, Josh Abelow, Andrew Kuo, Glen Baldrige, and Gina Beavers wagered original works of fine art at NADA. Several limited edition decks of the standard-size Art Patron Playing Cards (sold at the gift shop for $40 on the recommendation by Alex Galan of Artbook/D.A.P. 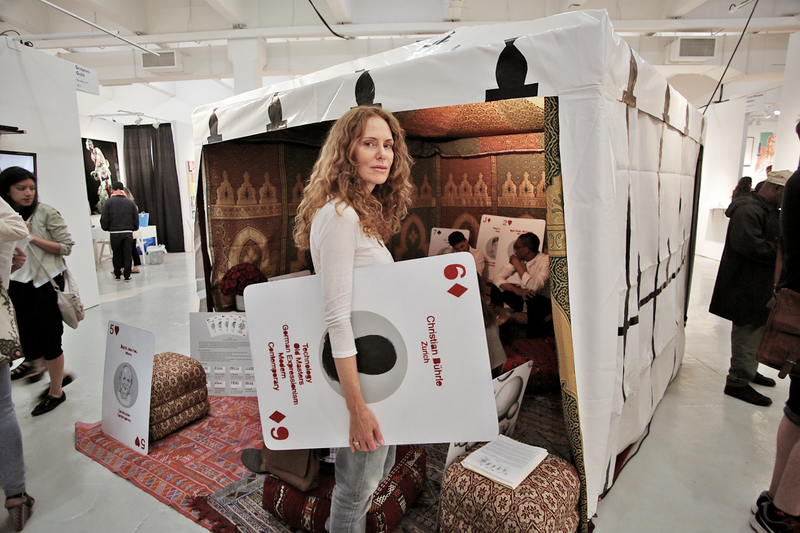 and Trunk Archive) were stolen while Rogers spoke with NADA fair director Heather Hubbs five meters away. Surrounded by an atmosphere inspiring art thievery and texts among billionaires, collector Martin C. Liu's appraisal of "Court" as "very clever... better than I've seen at the fair" seems like a warranted observation. This article is part of an ongoing photojournalism survey of art exhibition openings titled EMS N(art)rative. Through my lens I document a photographic essay or visual "N(art)rative" that captures the happenings, personalities, collectors, gallerists, artists and the art itself; all elements that form the richly varied and textured fabric of the SoCal art world. This reconnaissance offers a unique view for serious art world players to obtain news and information on the current pulse of what's in the now, yet capturing timeless indelible images for posterity and legacy. Here is EMS N(art)rative Twenty-Five.